The move is the latest and most comprehensive push to alter governance practices in the wake of Wall Street's meltdown. Some provisions in the proposed bill respond to criticism that shoddy oversight and warped executive-pay practices allowed banks to engage in risky businesses that later imploded. "The lack of corporate responsibility and accountability to shareholders is one of the core problems we face," the New York Democrat said. One provision would require the boards of public companies to appoint special committees to oversee risk management, according to a draft of the proposed legislation reviewed by The Wall Street Journal. The Securities and Exchange Commission is considering a rule that would require boards to disclose their role in managing risk. 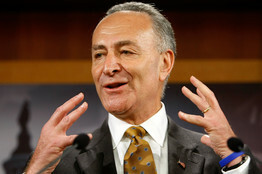 Sen. Charles Schumer, at the Capitol in January, will press for 'corporate responsibility' in a planned governance bill. Sen. Schumer's bill also would require public companies to give shareholders an annual nonbinding vote on their executive pay practices. Such votes, dubbed "say on pay," are now mandated at roughly 400 firms that received aid from the federal bailout program. Say-on-pay legislation passed the House of Representatives in 2007, but stalled in the Senate. House Financial Services Committee Chairman Barney Frank is working on say-on-pay legislation as well, and some form of the measure is widely expected to pass this year. Sen. Schumer also would require companies to give shareholders a nonbinding vote on severance packages for executives following mergers or acquisitions. His bill also would address long-running investor complaints that it is too easy for company management to stack the board with friendly directors, and too hard for shareholders to do anything about it. The legislation would require companies to hold annual director elections rather than putting only a portion of the board up to vote each year, as many companies do. It would require directors to resign if they don't win a majority of shares voted. The bill also would buttress potential SEC rules that would make it easier and cheaper for investors to nominate their own directors. The SEC is considering a number of "proxy access" techniques and could issue a rule in mid-May. The bill also would require board chairmen to be independent directors.